National Access Cannabis Corp. operates retail locations that sell and distribute cannabis and medical cannabis products besides offering cannabinoid education. From August 31, 2018 to November 30, 2018, the assets increased from CAD 46 million to CAD 86 million, representing 86% increase. In the three months ended November 30, 2018, revenue was equal to CAD 3.78 million, 779% more than in the same period of 2017. Assuming revenue growth of CAD 15 million or $11.25 million, National Access Cannabis is trading at 12.44x forward sales, which is more than that of most competitors. While National Access Cannabis reports more gross profit margin and revenue growth than peers, the company does not represent a clear opportunity at the current EV/forward sales multiple. 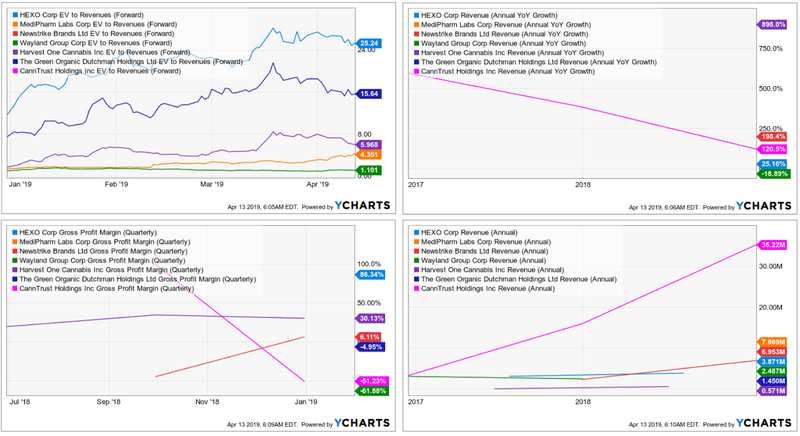 With triple-digit revenue growth q/q in the three months ended November 30, 2018, National Access Cannabis Corp. (OTCPK:NACNF) should attract many cannabis investors. Having mentioned this beneficial feature, the company trades at 12.44x forward, which is higher than the multiple of many competitors. 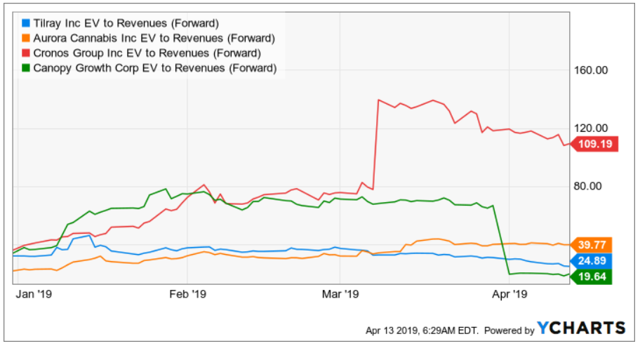 While the valuation can be justifiable as revenue growth and gross profit margin are large enough, the upside potential is limited. In 2019, the EV/forward sales could increase once new retail stores open up. However, the current financial figures don’t represent a clear investment opportunity. 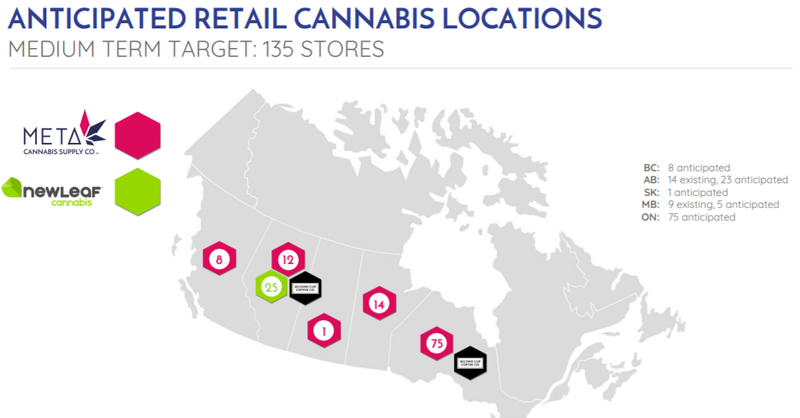 Founded in 2015 and headquartered in Ottawa, Ontario, National Access Cannabis Corp. operates retail locations that sell and distribute cannabis and medical cannabis products besides offering cannabinoid education. The supply of medical cannabis is another source of revenue for National Access Cannabis. The company employs cannabinoid therapy educators and cannabinoid therapy assistants, who offer product selection and cannabis education and coordinate patient registration with approved licensed producers. The amount of potential revenue from this activity is significant. 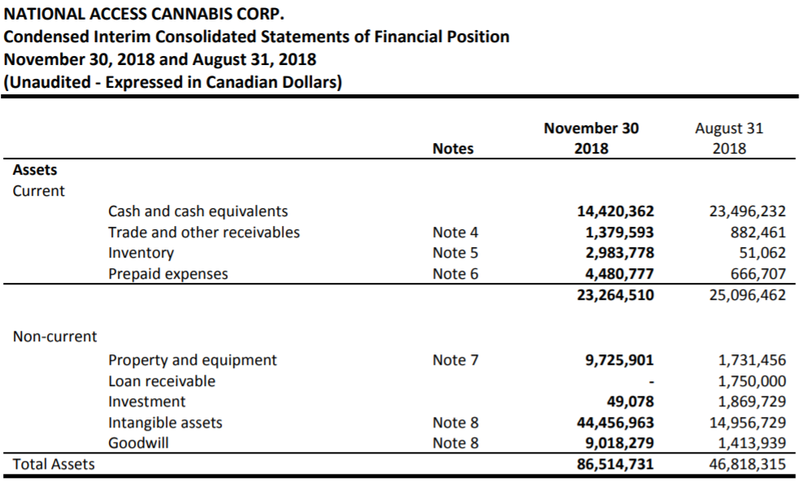 According to the materials distributed by National Access Cannabis, the company could be targeting a total market of CAD 146.4 million. While inventory increased from CAD 0.051 million to CAD 2.98 million from August 31, 2018 to November 30, 2018, the most remarkable was the increase in intangible assets and goodwill. 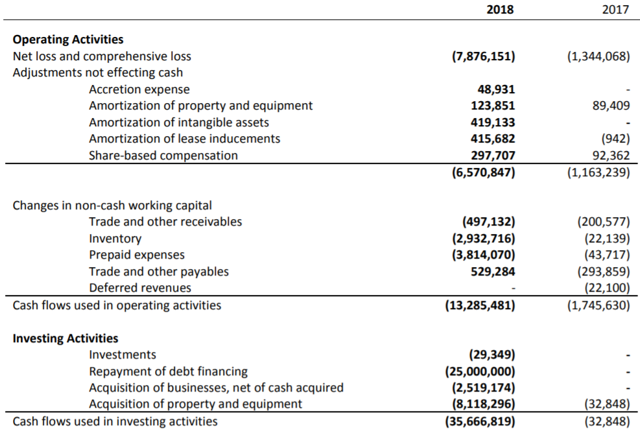 In the same time period, intangible assets increased by 197% amounting to CAD 44.45 million and goodwill increased by 543% amounting to CAD 9 million. With these numbers in mind, market participants should be interested in the close assessment of the company’s recent acquisitions. As shown in the image below, National Access Cannabis reports intangible assets worth CAD 29 million. This is exactly the same amount that was worth the 20 development permits acquired from NewLeaf. In the three months ended November 30, 2018, revenue was equal to CAD 3.78 million, 779% more than in the same period of 2017. With this in mind, assuming revenue growth of CAD 15 million seems very reasonable. Growth investors should appreciate these features and revenue growth. 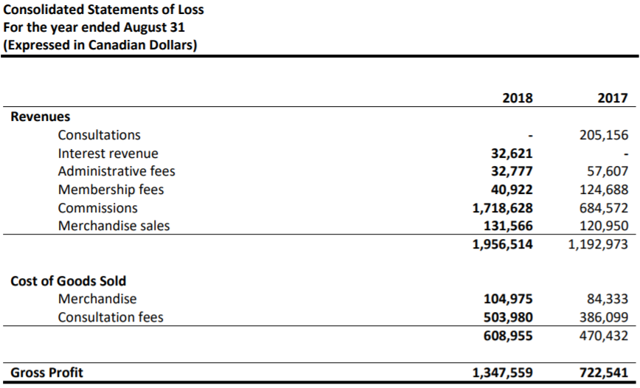 This type of investors should not care about the net income loss of CAD 7.8 million. If revenue growth and gross profit margin continue to impress the market, the losses may not matter a lot. Assuming 204 million shares at $0.68, the total market capitalization should be equal to $138 million. Deducting CAD 14 million or $10.5 million in cash and debt of CAD 17 million or $12.75 million, the total enterprise value should be equal to $140 million. In the three months ended November 30, 2018, revenue was equal to CAD 3.78 million, 779% more than that in the same period of 2017. With this figure in mind, many market participants may accept paying 12.44x forward sales for the company’s shares. 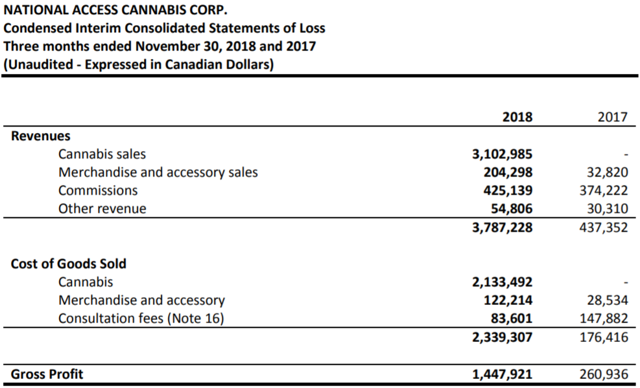 While this figure may be justifiable, the company is already trading above the level of other cannabis retailers. Taking into account the fact that the potential upside in the valuation does not seem to be large. As a result, the company does not appear to represent an investment opportunity.